Traveling alone as a woman can present challenges, but that doesn't mean that you should just stay home while everyone else enjoys the benefits of travel and backpacking. 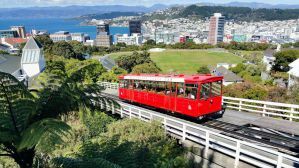 We've put together a list of hostels in New Zealand that all offer great amenities and features for ladies looking to go out alone or in groups so that you can stay safe AND have fun. The Nomads Fat Camel might have a bit of a party hostel reputation during summer months, but the all-female apartment means that you can separate yourself from pretty much anything and anyone when you want to. This hostel is not set up like a traditional hostel, instead, the building is divided into apartments (it used to be an apartment building), and each apartment is a small dorm, complete with its own kitchen and bathrooms. This is a great spot for solo females or small groups traveling together to have a safe and fun place to enjoy Auckland. The hostel also has a long list of nice amenities, such as a great common room. And the location is perfect, too. The Almond house is a little slice of home away from home. Run by former travelers, this hostel has everything you need to stay comfortable. The shared kitchen and common room areas are quiet, relaxing, and warm in the winter, but sunny in the summer. This place has it all, and with a terrific location, too. Warm in the winter with their cozy common room areas, this is a great place to relax, meet other travelers, and take in the views. Private rooms and dorms are available (including an all-female option). They offer free breakfast during winter months, too. The location is convenient and safe, as it's close to everything in town you would need for your wilderness adventure. The Central Backpackers in Dunedin has a lot of great amenities in a quiet and relaxing hostel. The location is perfect: right in the middle of the city close to everything. Yet the hostel itself is located on an upper floor of a building with secure locks and comfortable common areas. Private rooms and an all-female dorm option are available. Plus, they have other typical amenities such as a shared kitchen, laundry, luggage storage, Wi-Fi, and more. This relatively small but social hostel is very modern and offers a lot of security. Located above a pub (which keeps the partying downstairs instead of in the dorms), and in a central location in Dunedin, you'll be able to step out and have fun when want, but return to some peace and quiet when you need to. The hostel was custom built, very modern, and has great facilities. The shared kitchen and outdoor terrace make for some nice spots for relax and socialize, while the staff can arrange for tours and activities. This old art-deco style hotel was converted into a hostel, and offers an all-female dorm area. The staff is super-friendly and the location just near the beach can't be beat. Nearby, shops, restaurants, and bars can be found as well. This soul-filled hostel is full of art, music, and atmosphere. The chill vibe is set by the staff and the other guests in this perfectly located hostel that offers a long list of amenities such as free bicycle rental, herbs for cooking in the stocked kitchen, tea and coffee, and more. And all female dorm is available, as are private rooms. The staff goes out of their way to make sure that everyone is having fun, staying safe, and enjoying the hostel as well as the surrounding city. The Harbourside City Backpackers is right in the middle of central Tauranga, close to shops, restaurants, bars, and more. But the hostel itself is relaxed and chill, but with a social vibe that is great for mingling with other guests. Their top level terrace has beautiful views and chairs for sunning, and the facilities are all clean and modern. The Trek Global is in a great location, close to everything in town right in the heart of the city. This multi-story hostel has an all-female floor with all-female bathrooms, making this a great option for solo females or female groups of various sizes. They also offer private rooms. Additionally, their common room spaces are relaxing and fun. The shared kitchens, outdoor terrace and BBQ, game room, TV room, and other common areas allow for you to mix and mingle with other travelers when you want. The Q2 offers so much for guests. In addition to an all-female dorm option, security here is good. And so is the location and the list of amenities. This modern and clean hostel has up to date facilities to make your stay more comfortable. They provide a shared kitchen, internet, relaxing social and common spaces, and more. This is one of the smaller hostels in Queenstown (but still with 55 beds), so it's not as chaotic as some of the others. But bars and nightlife are nearby when you want it.